Cabernet Sauvignon by Watershed of Margaret River. On the palate, the dense velvety texture is complemented by cigar box, black olive notes followed by fine silky tannins from extended ageing under fine French oak. Watershed's superior vineyards span across an immense area of the choicest soils on Margaret River, the best eighty hectares were established from the ground up, with a view to vintage the most spectacular wines in the Australian west, the finest parcels of estate grown Cabernet Sauvignon are assembled for the Awakening. Watershed Vineyard is situated five kilometres south of Margaret River at the intersection of Darch Road and Bussell Highway, the major arterial road for traffic travelling to and from Margaret River township. Awakening is drinking beautifully upon release, an outstanding Margaret River to accompany grilled meats, game or lamb. Watershed Premium Wines is one of the few major producers in Margaret River to have the capacity to satisfy the international wine market demand, responsible for the single largest initial vineyard planting in the region. With 117 hectares under vine, in the vintage 2006 Watershed crushed around 950 tonnes with a future expectation of 2400 tonnes, around eight times as much as the region’s largest boutique vineyards. 60% of vines are currently made up of red varietals, 40% being white varietals. There are currently 1,200 vine rows on the Stage 1 property – measuring 270km, the distance between Margaret River and Perth! 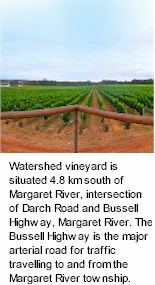 The Watershed vineyard is situated 4.8 km south of Margaret River at the intersection of Darch Road and Bussell Highway, Margaret River. The Bussell Highway is the major arterial road for traffic travelling to and from the Margaret River township. The Watershed vineyard has extensive Bussell Highway frontage, which contributes significantly to the profile and cellar door sales of the Margaret River Watershed Premium Wine Project. Watershed's Stage 1 vineyard comprises a total area of 127.2901 hectares, of which 79.9 hectares has been established as a vineyard. The 130,209 vines were hand planted in August/September 2001. The Watershed vineyard is in the dress circle of Margaret River being on the Bussell Highway at the turn-off to Leeuwin and Voyager Estates, the two most visited wineries in Margaret River. In March 2004 Watershed purchased it's Stage 2 vineyard over the road from it's exisiting site. In September 2004 33.3 hectares were planted giving Watershed a total of 117.45 hectares under vine. The stage 1 dam was constructed in April 2000 at an initial cost of approximately $240,000. The dam was subsequently expanded to a water storage capacity of 201 megalitres during the first quarter of 2001 at an additional cost of approximately $110,000. Despite Margaret River receiving well below average rainfall last winter the dam overflowed again in August 2006. Watershed's 2004 Shiraz and 2004 Cabernet Sauvignon Merlot both collected Gold Medals at Mundis Vini in Germany, the world’s largest international wine show. The 2004 Shiraz had already won gold medals at the 2007 Sydney International Wine Competition and the 2007 Royal Sydney Wine Show in addition to silver medals at the 2007 Decanter World Wine Awards and the 2006 WA Qantas Wine Show. The 2004 Cabernet Sauvignon Merlot had already collected a silver at the 2006 Mundus Vini Wine Show. As well as Margaret River’s traditional varieties of Chardonnay and Cabernet Sauvignon, some alternative varietals have been planted, such as Zinfandel, Sangiovese and Viognier. The first vintage grapes were sourced from several growers in the Margaret River region, off vines between 7 to 20 years in age. The first release wines in 2002 were produced by then wine making consultant, John Wade, at a contract winery in Margaret River. The second vintage in 2003 sourced grapes from contract growers and, for the first time, fruit from the Watershed vineyard was processed at the Watershed winery by the Winemaker. In December 2004 the first of the reserve style range was released with the 2004 Awakening Sauvignon Blanc, followed shortly by the 2004 Awakening Chardonnay and the 2003 Awakening Cabernet Sauvignon. Now onto their second vintages, these flagship wines have recieved a host of accolades and awards. In February 2005 the 2004 Viognier was released, becoming the first wine to be produced from 100% Watershed fruit. Now onto its second vintage, it has also been accompanied by the 2004 Zinfandel (since sold out) as fully estate grown wines. Watershed's 2006 Unoaked Chardonnay collected a Gold Medal at the 2007 Perth Royal Wine Show. This followed prior success when it collected a Gold Medal at the Royal Queensland Wine Show and the 2006 Margaret River Wine Show when it received the highest score in the 2006 Chardonnay class. Another great example of the outstanding quality of Watershed's premium wines at super affordable pricing.